Our teaching resources support educators in teaching the Holocaust by offering both content about Holocaust-related themes as well as innovative teaching strategies. The resources correspond with core competencies of 21st-century learning and the new BC curriculum and include student worksheets and classroom activities. 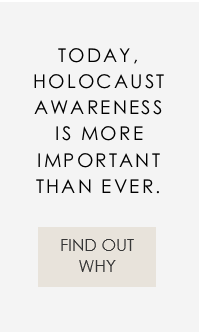 This general resource contains guidelines for teaching about the Holocaust, suggestions for preparing students for Holocaust survivor outreach speakers, more than 30 frequently asked questions about the Holocaust, a timeline, a glossary, as well as recommended websites and readings. Teachers’ Guides complement current and past VHEC exhibitions and support classroom learning. They include pre and post-museum visit activities, discussion questions, student readings, primary documents, glossaries, timelines and recommended resources. Discovery kits are available for four-week loan periods free of charge and are recommended for students of grades 6 to 12. The kits include reproductions of documents and artefacts from the VHEC and other collections. Students are encouraged to examine, describe and analyze the artefacts as a way to investigate issues of discrimination, segregation, hiding, resistance, as well as the aftermath of war and immigration. Learning is supported by student information cards and teachers’ guides. Pick-up and delivery or courier costs are the responsibility of the teacher. Classroom book sets are chosen to engage young learners while offering insight into the authors’ experiences of the Holocaust. They are recommended for students of grades 6 to 12. Classroom book sets are available for four-week loan periods free of charge. Each set contains 30 copies of the book, and some include additional resources and readings. Pick-up, delivery, or courier costs are the responsibility of the teacher.